The profession of Alchemy is very interesting and will reward you with useful potions that improve the stats of your character. In the beginning, you’ll be able to create simple and not very beneficial, but the more you advanced in Alchemy the cooler potions you will be able to create. For instance, early on you can make useful potions that give a great effect. As any other crafting profession in ESO, Alchemy has its own skill line. You will have to master some passives from this tree to be able to progress as Alchemist. The skill line is located in the Crafting section. Each ability will require a skill point in order to be learned or leveled up. Solvent Proficiency (1/7) - Allows alchemist to use [solvent type] to make level X potions. Keen Eye: Reagents (0/3) - Reagents in the world will be easier to see within 20/30/40 meters. Medicinal Use (0/3) - When using potions, resulting effects last 10% longer. Chemistry (0/3) - Produces 1 extra potion per crafting attempt. Laboratory Use - Allows the use of up to 3 reagents when crafting potions. The most important skill for progression is Solvent Proficiency. This skill allows you to use high level solvents. Solvent determines the level of potion and its strength. If you really want to progress in alchemy this passive must be learned. Laboratory Use is also very important passive. It allows to mix 3 ingredients and thus receive stronger potions. For example, if you don’t have this passive learned you can create a potion with up to 2 positive effects. But after you master Laboratory Use your potions can have up to 3 effects! For example, recover Magicka, increase Spell Damage and increase Spell Critical. Chemistry is also a very good passive because you can receive more potions per each crafting attempt using the same number of reagents and herbs. Other passives are not very important and you can play ESO without them. Keen Eye: Reagents highlights herbs and makes them much easier to see. Sometimes this passive helps a lot. But you can play the game and progress in Alchemy without this passive. An Alchemist needs different types of solvents and a lot of reagents: herbs, mushrooms, water plants and so on. Like all crafting professions, you need to search for ingredients while traveling and exploring the world. You will need a great number of different herbs in order to progress in Alchemy. The strength of your potions depend on the solvent you use to produce them. Solvent determines the level of the potion you create. In order to use high-level solvents, you will have to learn the Solvent Proficiency skill. If you don’t invest skill points in this skill you will not be able to advance far in Alchemy. But a solvent is only the first part of a recipe. You will also require other reagents that can be found almost everywhere on the map. Different types of plants will grow in certain conditions. For example, plants that like water can be found near rivers and lakes. Mushrooms are found growing near trees and in caves. Herbs grow in the field and Water can be found near waterfalls, in the rivers or lakes. There is a skill in Alchemy called Keen Eye: Reagents - Reagents in the world will be easier to see within 20/30/40 meters. This ability is passive and will help you to find reagents faster than players without this skill. Note: be quick. Ingredient mining in ESO is based on “First-come, first-served” rule. By having a Keen eye you can pinpoint on your map where reagents are without having to search blindly . If you have already tried other professions like Blacksmithing you probably noticed that Blacksmithing allows you to extract materials from items. 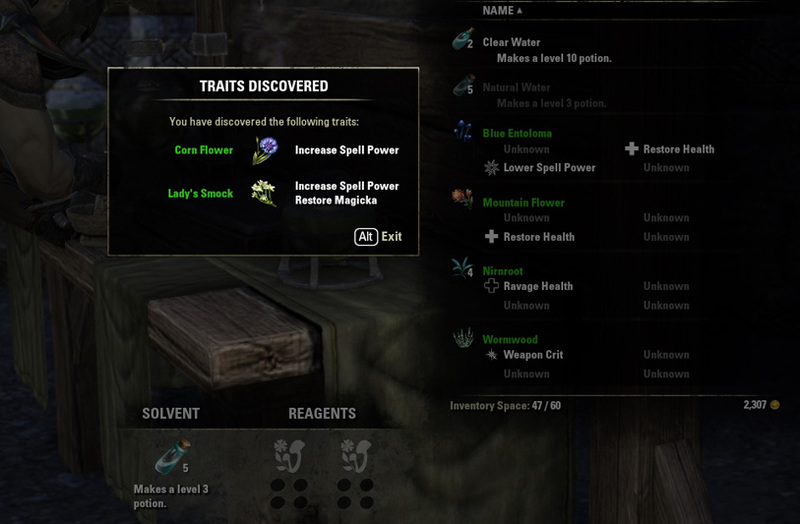 Unlike Blacksmithing, Woodworking and Clothing Alchemy in ESO doesn't allow to Extract reagents from potions. Alchemy allows only the creation of new potions. When you have collected your reagents you need to find an Alchemist Table. They can be found in all the big cities. The table allows you to use the crafting interface of an Alchemist. Each reagent has 4 different traits. When you use the table for the first time you will see that all the traits are locked and hidden. How then do you unlock the effects? It’s simple – you just need to eat the reagents to discover the first trait and start crafting potions to discover other. You discover the effects of a particular reagent by mixing it with other ingredients and trying to create a potion. If the combination is appropriate, you’ll be able to create a potion and discover the effects of the reagents you mixed. As you can see, discovering new effects is a very interesting process. It's all trial and error. Sometimes you will fail and sometimes you will discover great combinations. Once you discover a successful combination your character will remember it and when you add the same ingredients in the future you will see the potion that will be created. NOTE: The information below may influence your gameplay. If you want to discover everything yourself – don’t read the table below. There are no low level and high level herbs. There are no rare and unique ingredients. All herbs can be found at any location! Mixing 2 ingredients will provide you with great potions but you can make much better potions if you master Laboratory Use skill - it Allows the use of up to 3 reagents at a time. This skill can be unlocked at the 15th level of Alchemy. You can create amazing potions with this skill. For example, Dram Of Spell Power: Increase spell damage, increasing spell critical, restore Magicka immediately and restore magicka over time. As you see this potion is amazing for any spellcaster. When you start mixing 3 ingredients you may face with problems of Anti-Traits. Anti Trait is a counter version of a useful trait. For example, there is a trait that Restores Magicka and it is a beneficial one, and there may be an anti-trait that Ravage Magicka. You need to take this into account. If you combine several ingredients with similar Anti Traits you will get a useless potion that will, for example, ravage health immediately and ravage extra health over time; or stun you for 3 seconds :) You see that such potions are absolutely useless. But developers mentioned that they will probably add poisons in future. Such mechanics may allow crafting poisons. Right now there is a special passive ability called Snakeblood - Reduces negative effects in potions by 50%. This passive is great for all alchemists because you will be able to craft potions with lower negative effects. The list below contains several great combinations of reagents you should try. The potions you will get are one of the best. You advance in Alchemy every time you create a potion. Unlike Blacksmithing, Woodworking and Clothing where you can create, improve, extract and research items, in Alchemy you can only create different potions. That’s why you receive more experience per item created. My own leveling experience has shown me that Alchemy is much easier to level up than Blacksmithing. Alchemy can be a rather profitable profession. You can create top-level potions and sell to other players in guild stores. The general advantage of this profession is that portions belong to consumable items and affect a player for a short period of time. Players always need a lot of potions for PvP, dungeons, and questing. If you want i can expand your alchemy-database. I'm a dedicated alchemist and i have some reagant effects that you guys don't have yet. Do you mean the alchemy properties from beta will be changed for launch? I dom't think so. On my oppinion the crafting system is already finished. But maybe something will be changed — who knows. Pretty sure the alchemy properties stay the same, but (i hope) their are a lot more ingredients that have been disabled for beta. I've seend tons of plants that looked like nodes but weren't. Thanks, I have added this in the table. Greetings. I have acquired what I assume to be all alchemy items and all effects. Here's what you're missing. Thanks for the information Derp. I have updated the table according to your data.